Posted on 17, July 2018 by EuropaWire PR Editors | This entry was posted in Environment, Industrial, Luxembourg, Technology, Transportation & Logistics and tagged carbon emission, CHINA, Diogo Cão, green vessel, Jan De Nul, Robby De Backer, vessels. Bookmark the permalink. LUXEMBOURG, 17-Jul-2018 — /EuropaWire/ — The 3,500 m³ Trailing Suction Hopper Dredger Diogo Cão was launched last Saturday at the Keppel Nantong shipyard in China, a subsidiary of Keppel Offshore & Marine. This green vessel is the second of three 3,500 m³ hoppers to be launched, equipped with an exhaust gas treatment system filtering out and virtually eliminating many pollutants from the exhaust gases. 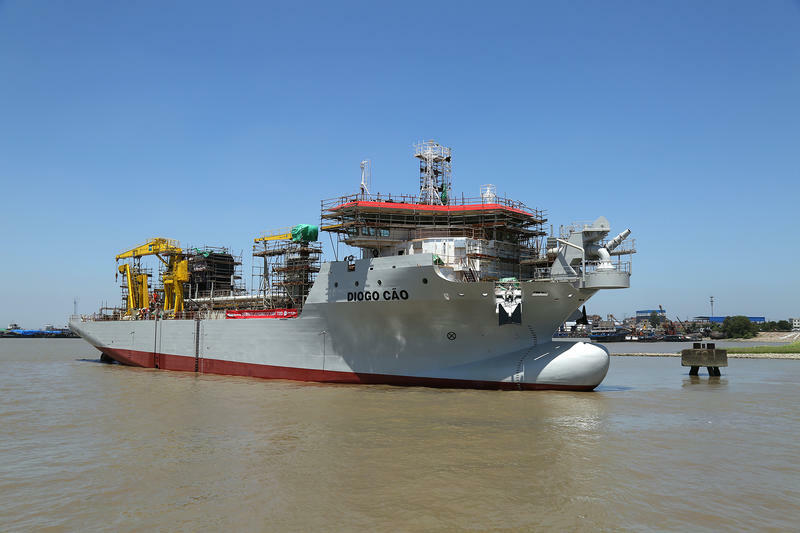 In total, Jan De Nul Group ordered six such ultra-low emission Trailing Suction Hopper Dredgers, called Ultra-Low Emission Vessels, five of which are being built at Keppel: three small 3,500 m³, two medium-sized 6,000 m³ and a larger vessel at 18,000 m³. The Diogo Cão is in diesel-electric execution: all major drives (thrusters, dredge pump, jet pumps…) are electrically driven, and controlled by means of frequency converters. In this way each system can operate at its optimal speed and power. Power is generated by means of three diesel generator sets. A control system automatically starts and stops the sets depending on the power requirement. Asymmetric load sharing results in optimal load distribution over the diesel generator sets. All these measures result in a low fuel oil consumption, which is the best in its class. ← Henkel enters the Chilean building materials market with the acquisition of Aislantes Nacionales S.A.